By holding the ball from a two point fixation the ball can be struck on a diagonal swing path with no tee interference and contact. 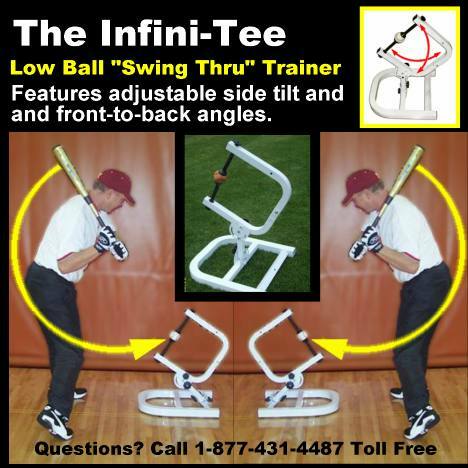 This new tee concept is the missing link to creating line drive power , plate coverage, gap to gap ball flight distribution, and PROPER WEIGHT SHIFT. It is important to see that the swing is neither level, down or up but DIAGONAL in nature. That is the purpose of this tee. Teaches a "short A to C" Swing. 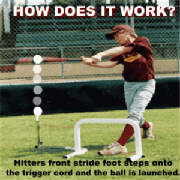 Allows repetitive practice at hitting the most frequent strike a batter sees; the low and away strike. Taking the knob DIAGONALLY down to the ball and getting the hands infront of the ball drills proper weight shift and allows batter to most direct access to the ball center where compression is greatest. Why is the angled design so important? Tees that have a flat top give the batter the sense of needing to lift the ball upward off the tee. This natural reaction of the body to avoid tee contact prevents proper weight shift and body axis formation prior to the actual swing. While most MLB swings are slight upper cuts, any premature tilt of the body before the front foot gets down must be avoided. Current tees foster bad mechanics at an early age that can ingrain a flawed swing. They keep too much weight back forcing the top hand to round off the swing, circling the ball on the ground to third base over and over. Caution: The Infini-Tee is for specific advanced skill training. This product is not a TOY. It is made for kids under adult training and constant supervision. 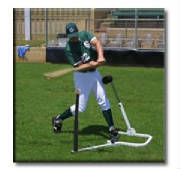 The Tee holders allow adequate clearance of the swing path of experienced batters. This product is NOT recommended for beginners with minimal body control and hand to eye coordination. The Tee holders present a potential risk to your bat, bystanders, and /or your wrist if struck. We consider these risk OBVIOUS RISK but suggest that the product suitability be considered concerning the level of the baseball / softball batters and the goals of the coach. The levels recommended are certain supervised LL "select" players , advanced JV, High School, College and Professional players.